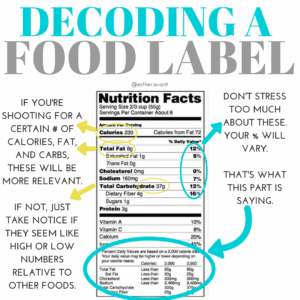 Learning how to read food labels is a skill that all adults should have. Whether you’re wanting to lose or gain weight, get off prescription medications, or just generally be cognizant of your health, being able to flip the package around and decode the label is important. 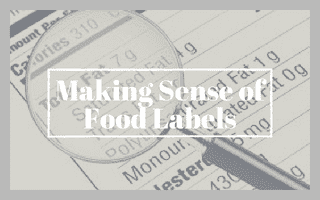 This article will walk you through how to decipher a food label so that you can make informed decisions. Some of the most important info on the label is at the very top. Here you’ll find the serving size and number of servings in the package. If you are tracking calories or macros, use the more exact measurement whenever possible. If you’re not in a focused fat loss phase or don’t have access to the appropriate measuring tools, a rougher estimate is fine. Servings per package are estimated so in the event that you do measure out servings, you may find a difference from what the label indicates. Important Note: If a package has multiple servings but you eat them all at once, you need to multiply everything on the label by the number of servings. 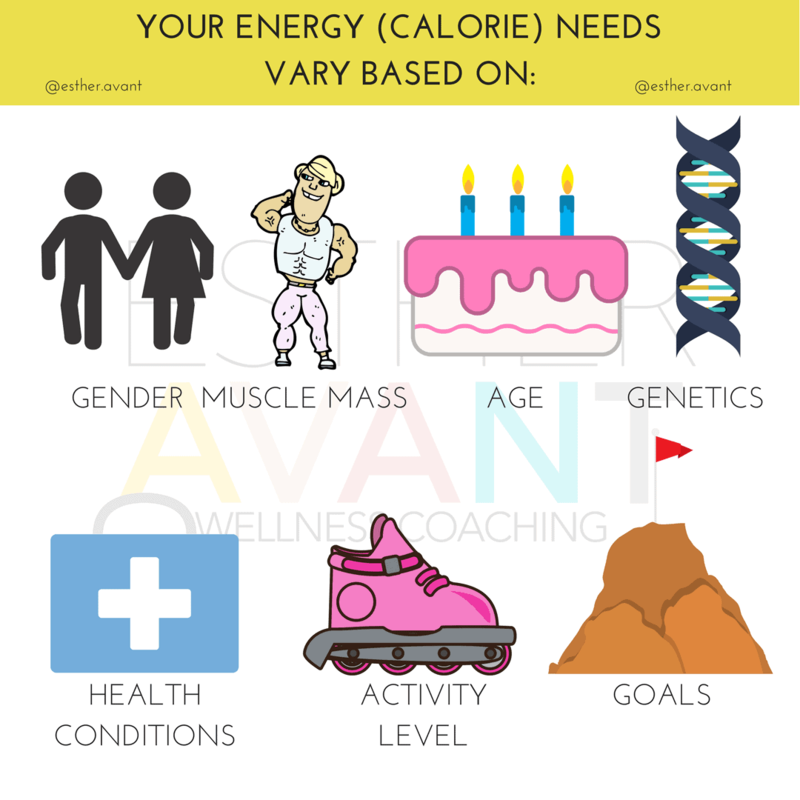 Calorie needs vary greatly from person to person based on a variety of factors. Younger people will have higher needs than older. Genetics and health conditions can play a role in metabolic rate. People who are more active (whether through intentional exercise, active jobs, activities of daily living) need more calories than people who are less active. People who want to lose weight will need fewer calories than those trying to maintain their weight. Because of these differences, there is no set number of calories you that everyone should be taking in. In my Gone For Good weight loss coaching program, we factor in all of these things into your targets but a general caloric starting point for weight loss is 10-13xBodyweight. The calories listed on food labels are relative to your overall needs. Without an estimate of your daily caloric intake, it’s hard to put calorie content into context. 300 calories is pretty minimal for a large, active man whose daily goal is 3,000. 300 calories pack much more of a punch for a small, sedentary woman trying to lose weight on 1,500 calories per day. This context is important to help you make informed decisions about which foods to eat and in what quantities. Similarly, the % daily values are based off a 2,000 calorie per day diet, which means that unless 2,000 calories also happens to be your daily target, these numbers don’t mean much. Important Note about 0-Calorie foods: Current FDA guidelines allow companies to put 0-calories on the label if there are fewer than 5 calories per serving. This is inconsequential if you only have one serving of said food but can become an issue if you’re using the 0-calorie-ness to justify having way too many servings. Even multiple servings of something with, say, 4 calories per serving isn’t very significant but it is something to be aware of if you think you’re in a calorie deficit but aren’t seeing any weight loss. If you’re using several servings of different “0-calorie” foods each day, those small amounts can add up. Like total calories, fat and carbohydrate needs vary. 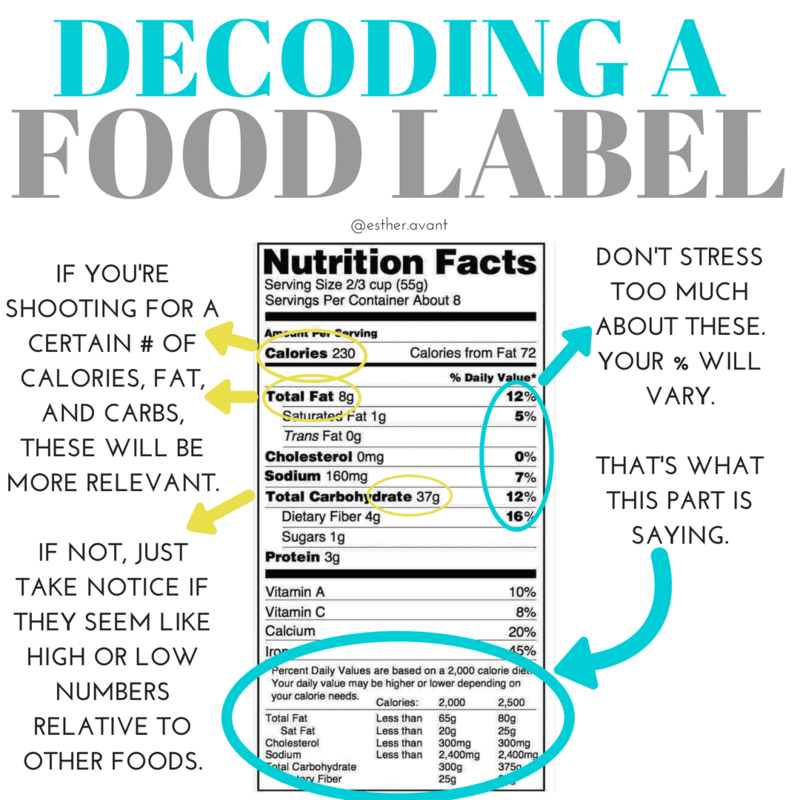 Without an estimate of your targets, it’s hard to put the numbers on the food labels into perspective. As long as your total calories and protein (see below) are aligned with your goals, fat and carb targets are secondary. If you prefer one over the other, it’s fine to prioritize one over the other. As a guideline, you’ll want to set your fat target at a minimum of .3g per pound of bodyweight. This will cover your essential fat needs but it’s fine to eat more that than this if you like. Once you know how many grams of fat you’re shooting for each day, that number becomes a benchmark when you’re looking at food labels. If you weigh 150 pounds and are shooting for the minimum of .3g of fat, that’s 45 grams of fat per day. Your body doesn’t need carbs for survival but they are your body’s preferred source of fuel and they provide fiber, vitamins, and minerals. If you are sedentary, maybe most of your carbs will come from vegetable sources. If you’re an endurance athlete or have a very physical job, maybe a larger percentage of your daily calories come from carbs. Typically I start clients with somewhere in the ballpark of 30-40% of their total daily calories coming from carbs. From there, we’re able to tweak based on personal preference and results. Say your daily calorie goal is 1,500 calories and 40% are coming from carbs. First figure out how many calories are coming from carbs (1,500x.4=600). To convert from calories to grams, divide by 4. This is because carbs have 4 calories per gram. 600/4=150g of carbs per day. 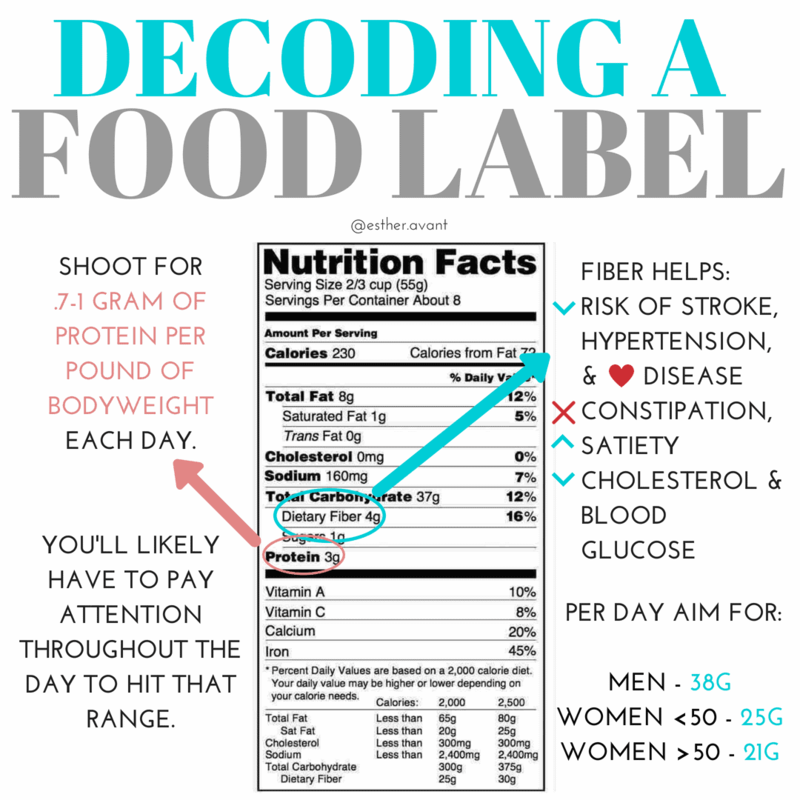 Now that you have these targets in mind, the numbers on the food labels will be morevaluable. If you’re looking at a label that has 20g of fat or 75g of carbs, you have a much better idea of whether this is a lot or a little for your personal needs. Even without a certain number to shoot for, these numbers aren’t useless. You can take notice of how fat and carb content compares among different foods. If you’re trying to lose weight (fat) while retaining muscle, a sufficient protein goal is between .7-1g of protein per pound of bodyweight. Using the 1 gram goal makes for the easiest math but may prove to be challenging to reach. Set your goal there and know you’re still covered even if you fall a bit short. In my experience with coaching weight loss clients, hitting that goal takes a concerted effort throughout the day. Make sure to check food labels for protein content and keep a running total throughout the day so you don’t come up too short. Fiber is the part of plants that our bodies can’t break down and digest. It’s important for reasons like decreasing the risk of stroke, hypertension, and heart disease. It can help decrease cholesterol and blood glucose. And you’ll probably poop better if you eat sufficient fiber. Part of why eating fruits and veggies is so important is because of their fiber content. Unfortunately, most Americans are lacking in the fiber department. Women should shoot for 21-25g of fiber each day (depending on age). Men should shoot for 38g. If this will be a drastic jump for you, I recommend increasing gradually to avoid any GI discomfort. What follows are current USDA guidelines for Americans. As always, it’s recommended to work with your doctor to determine your individual needs. This is especially true if you have, or are at risk of, certain diseases. Current USDA Guidelines for Americans recommend limiting saturated fat intake to 10% of total calories. To convert this to grams, first multiply your total calories by 10%. (Example: 1,500x.1=150cals) Then divide that number by 9, since 1 gram of fat has 9 calories. (Example: 150/9=16.7grams). Trans fats are made by injecting vegetable oils with hydrogen. Intake is linked to an increase risk of heart disease and negative impacts on cholesterol. They should no longer be an issue, as they were banned in the US in 2015. Companies were required to phase out use of them by June 2018. The USDA guidelines no longer limit dietary cholesterol (formerly capped at 300mg/day) thanks to new research suggesting that it does not affect blood cholesterol. 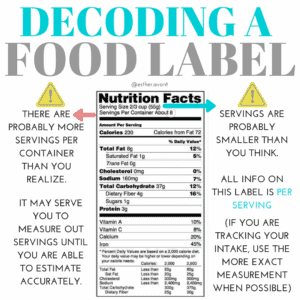 They key to getting comfortable reading and assessing food labels is to practice. Whenever you’re at a store, flip around some packages and take note of the label information. Compare seemingly similar items and see if there are any surprising differences. 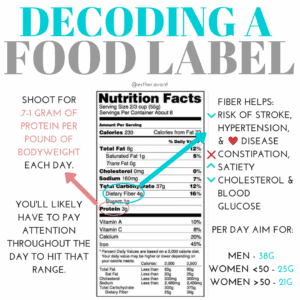 The more familiar you get with looking at food labels, the more helpful they’ll be at helping you make informed decisions. Got questions? Join my free Facebook group Live Diet-Free weight loss coaching and ask away!